History: After stumbling upon an artifact in an abandoned cave, Jeffery Jenkins was able to harness the power the Roman god Helios. 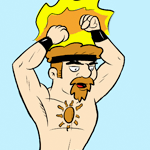 Now he fights evil as Solar Blaze. His mom tends to keep a close eye on him.